Often seen as the feminine energy of the angel Uriel, she is instrumental in helping you to develop, ground and manifest your ideas, nurturing your creative side. 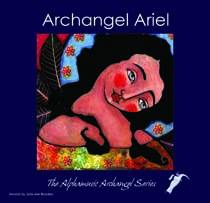 Ariel combines the energies of Raphael and Uriel to bring you healing to whatever blocks your creativity. She will help you let go of any fears of failure or not being good enough by opening the third eye to developing your intuitive and psychic awareness. Ariel connects you to your soul through the multi-dimensional plane as well as protecting the elemental kingdom. Because she represents both earth and air elements, she is able to combine them and facilitate real creative change in your life. As guardian of the Elemental Kingdom, those who have a strong affinity with mystical energies like, fairies, unicorns, tree spirits and so on can really benefit from Ariel’s influence in their lives.